No matter the topic or issue, the true meaning of the Ten of Cups is aligning your life so that you feel safe and secure and happy and energized. Harmony is the key word here. And, what one person defines as alignment could be the complete opposite from another person. As long as your happiness does not interfere with the happiness of anyone else, then pursue what makes you smile. Maybe take an inventory of all that is good in your life and give thanks. If you know that there is a lack within your world, what can you do to change it? When the Ten of Cups appears, know that any positive changes you make will be enhanced by this card’s energy. So, put aside your fears and proceed with a long-held dream. Find a way to take that trip to Iceland. Feel free to watch love stories. And, if you’re the type that loves to give, do what you can to help others find a little bit of happiness, as well. What do you want to do in July that you’ve not found the courage to do yet? The Six of Wands is all about success, victory and public recognition. Maybe you’ve been working on a goal for a few months or a few years. Whatever it is that you’ve been focused on, though, the Six of Wands recognizes the energy and effort you’ve put into your goal and now you’re close to reading the rewards. 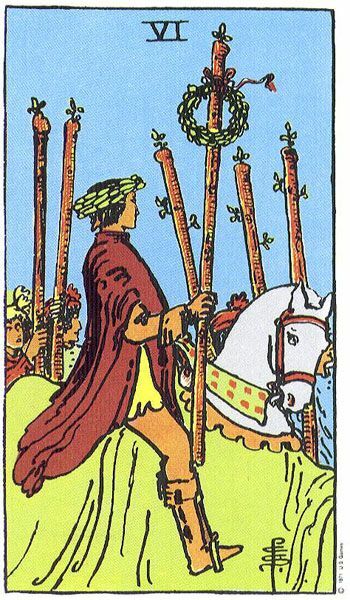 I love it when the Six of Wands appears in a reading, as it offers that last bit of encouragement that everyone needs to find that last little bit of strength and push forward. 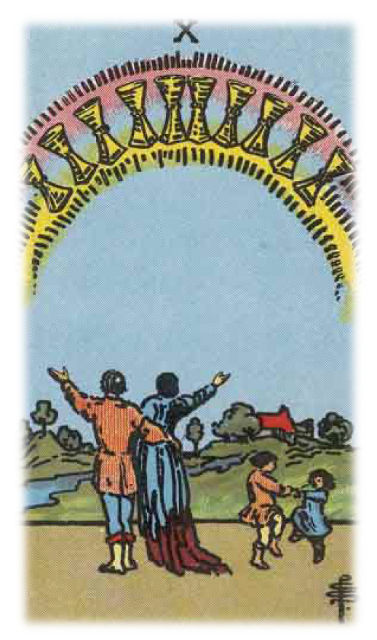 More often than not, this card indicates that the time, hard work, maybe even money that you spent to create something will yield positive results. And, this is true. However, while meditating on this card, I received a distinct message that this card is also talking to people who might be dealing with various health issues. With this card, recognize that it’s not time to give up. Keep fighting. Chances are better than worse that you’re going to come through whatever health issue you find yourself battling. You can do this! For those in the workplace or for those who earn a living based on a reputation, such as writers or performers, the Six of Wands is here to let you know that you are perceived in a positive way. So, enjoy it, and don’t let the compliments go to your head. And, if you are delighted that someone has recognized your talent, maybe offer on a little bit of advice and encouragement to someone who is new in their career or on their path. What kind of success will you be enjoying during August? The High Priestess – that lovely, wondrous, mysterious lady. The woman who represents deep knowledge and understanding, but knows how to use her tools to sprinkle a little magic upon all of us. She also appears to remind each and every one of us that we all have an inner knowledge, too, and while it’s great to get advice, know that you can rely on your instincts, as well. If all feels right to you, then keep on keepin’ on. However, if you feel out of sorts or feel unbalanced, take some time and reflect on what isn’t working and ask the High Priestess to offer guidance and insight. Then, take the steps necessary to fix what ails ya. When the High Priestess appears in readings, some think it refers only to an actual woman. This is not true. 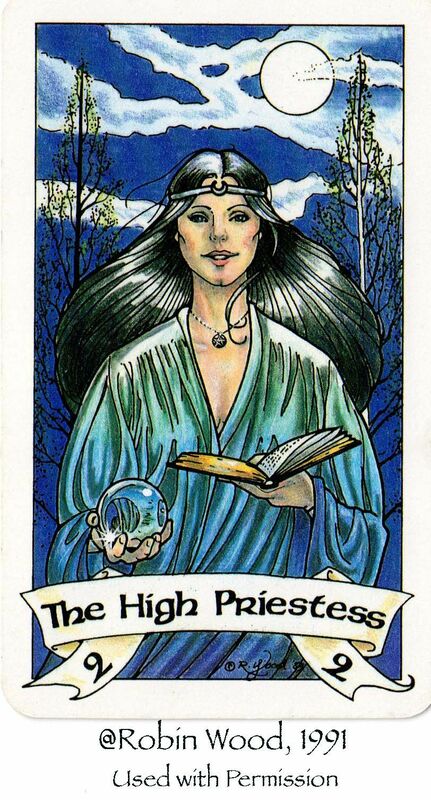 Granted, depending upon the reason for your reading, the High Priestess might be guiding you into one woman’s direction. But, it could most likely mean that you need to truly delve you feminine side, be you male or female. What nurtures you and how can you nurture others? For a male especially, the High Priestess Tarot card indicates that he must learn of his ‘anima’ or female side, or he will fail to grow. For a woman, the High Priestess suggests that she must learn to trust herself and to be truly feminine, rather than succumbing to the pressures of having to act more like her male counterparts. While pondering this card, I got the message that some of you might be struggling with forgiving one or more people. Only you can decide whether another is worthy of your forgiveness, and while this is not usually the energy that the High Priestess brings, she would be the first to tell you that you must do what is necessary to gain a deeper understanding of events. If this makes you feel like you need to forgive someone, fine. But, really – I think – the bigger lesson of forgiveness is understanding how you played (or, were played) into a situation and then learn how to move into your future with more wisdom. What kind of magic and understanding are you dealing with this September?